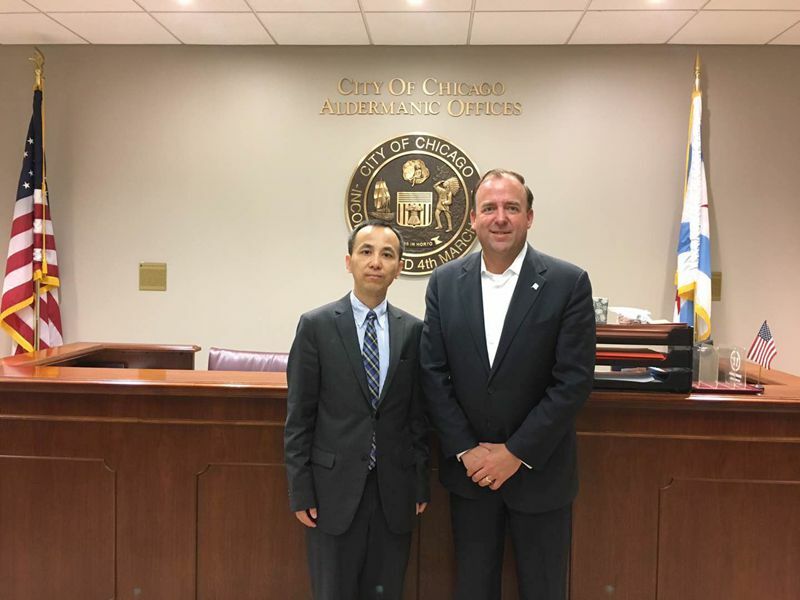 On July 18, Acting Consul General Liu Jun met with Vice Mayor of Chicago and Alderman of Chicago's 42nd Ward Brendan Reilly in the City Hall. Liu Jun briefed Alderman Brendan Reilly on the cooperation between China and Chicago. He said that in recent years, the cooperation and exchanges between China and Chicago have constantly deepened and expanded. Chinese investments have created a lot of jobs for Chicago. For instance, Wanda Corporation is building the third highest sky-scrapper in Chicago, and CRRC is setting up a railway vehicle assembly factory, both of which are of great significance to increase employment and revive the manufacturing industry in Chicago and bring economic and trade cooperation between China and Chicago to a new high. Chicago has rich experiences in developing urban economy, city zoning, etc, from which China can learn in its urbanization. Reily said that the 42nd Ward covers a majority part of downtown Chicago with a large population and economic and trade vitality. It is the second largest economy in the whole state. The Ward has many Chinese investments which have made important contribution to local economic development and job creation. Chicago values the cooperation partnership with China and would like to keep close communication with the Consulate General to promote the cooperation to a new stage.